In the young and modern era of video games, there has been an incredible amount of broken bones, blood, and ultimately, violence in many of its productions. Games evolve, like any creative industry, to provide better experiences with age. Mobile gaming is at the infancy stage of its maturation. Mobile games have potential for unique storytelling that utilizes violence as a means to convey that message but unfortunately there has been little to no representation of that evolution. Ndemic Creation’s Plague Inc. evokes a different type of emotion that fits its mobile platform; the user carries the fun with equal amounts of regret in the curiously entertaining yet morbid experience. I started the simulator with the foreknowledge that I was pretending to destroy all humans. What I did not know, is that, I would carry the horror of the game well after the first playthrough. All one can do is wonder “What is this?” The game menus are not dynamic, but well explained. The user selects which type of virus they will become and the gene modifiers that will make it unstoppable. Viruses are specific to their infection capabilities and reactiveness to their counterparts ranging from the simple “Bacteria” to the advanced “Bio-Weapon”. Gene modifiers allow you to have five distinct traits that give particular bonuses depending on your playing style. The game is monetized by limiting you to only Bacteria and a finite amount of gene modifiers. The game presents enough of a challenge and ultimately allows for all special viruses, modifiers, and cheats (yes, cheats!) to be unlocked after successful completion of each standard virus on Brutal (hard) mode. 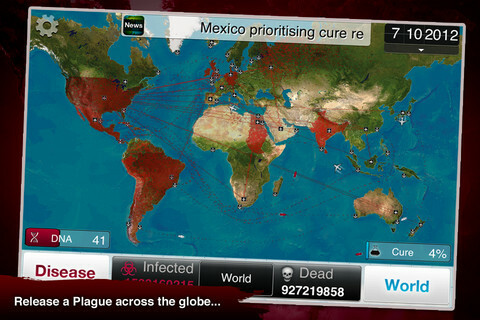 Plague Inc. makes the objective clear, you infect and spread. The game’s complexity arrives in the form of the cure and how you, as the virus, can mutate genetic defenses and deadly symptoms faster than your human counterpart can eradicate your existence. “I am Jack’s DNA sequence” or for the player, currency to develop the ultimate biological nightmare on their fellow human species. Once the onslaught has commenced, it is controlled chaos. Two in-game menus are available: Disease & World. Disease is where the diabolical genetics meet your fingertips. Here, you can see the history of your immature plague and have a trip down memory lane. Disease also attaches the genetic hacking mechanic to the globe as you use the options of transmissions (methods to distribute your plague, symptoms (increase infectivity, severity, and lethality), and abilities (defenses to cure) to further your cause. The World menu is a clever tool to guide your virus to the most opposing adversary. World is comprised of numerous charts and graphs that detail the rate and spread of your infection on the globe; as well as each “nation’s” response to the epidemic. What is the difference between terror and horror? When it comes to playing Plague Inc., the answer is nothing. I thought as I purchased the game “I am a bad person for buying this” and in playing the game “I am a bad person for playing this”. Unlike other titles, intentional or not, Plague Inc. gives us another take on “life”. No matter the size or stature of an organism, all living things want to continue to thrive. In the case of the outbreaks, there is a story to be told. What makes me a bad person, for the time I played, is that I wanted to win. The cost of winning is death to a fictional mankind; and in victory truth is illuminated and sheds away my benevolence for the duration. This lamenting effect on my mind makes me reexamine the state of violence in games. Because of the physical size, ram, and capable graphics of mobile devices, violence is mostly “cartoony” and underwhelming as it harkens to a time of less sophistication than contemporary consoles. Console titles like Spec Ops, examine violence through suspense and terror and keep it from ever becoming enjoyable. Others like the Dead Space series utilize violence to show horror and increase the fear of impending doom. Plague Inc. owes some of its mechanics to older hacking games (i.e. Uplink) but independently creates the perfect amount of voyeurism and loathing of completion in the player; while never showing a single NPC. Its violence is never manifested beyond a death counter and yet the player will imagine his or her own dismay in the presented global map. Well done for making me feel terrible; I’ll be playing again.